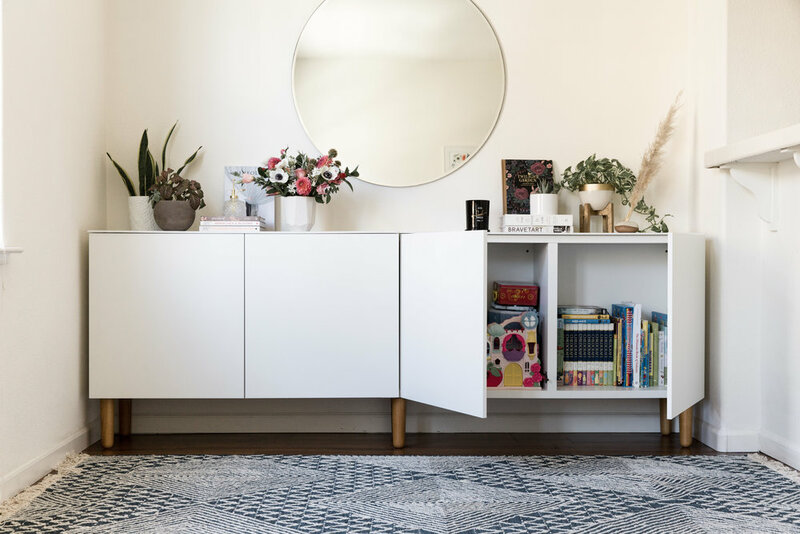 Awhile back, one of my dearest friends and fellow “mompreneur” Wury of Graceful Garland Co. enlisted me to help her transform her dark, cluttered playroom into a fresh, modern and clean space. 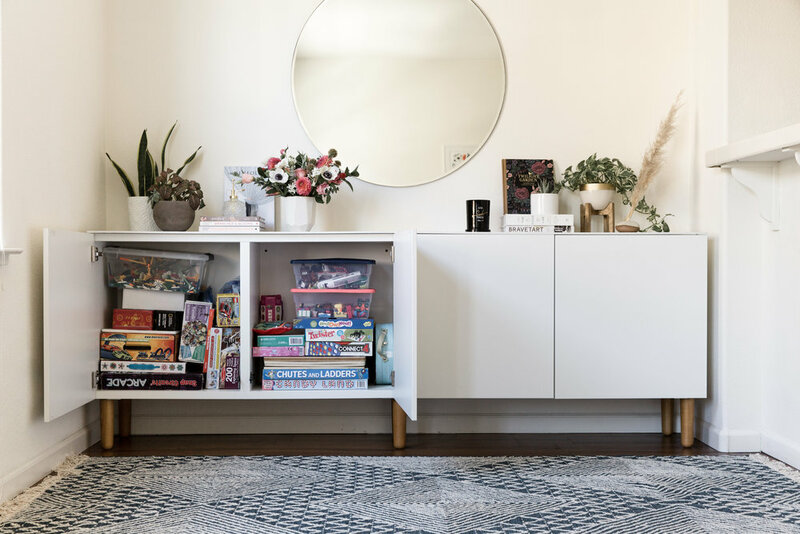 She wanted to have ample space to store toys and books for her three young children, but also wanted to be able to hide them all away when they were not in use, so that the space could feel multi-functional. We took away her dark bookshelves and moved her books to a different room. Wury went through and purged a lot of her less-used toys (a good practice that my own family likes to do a couple times a year), and we began sourcing optimal storage units that would fit the wall and provide ample storage space for puzzles, games and books. We landed on the Ikea Besta. Two of these side-by-side was an exact fit for the playroom wall. We upgraded the look and tied the two units together with some midcentury style wooden legs from Pretty Pegs. 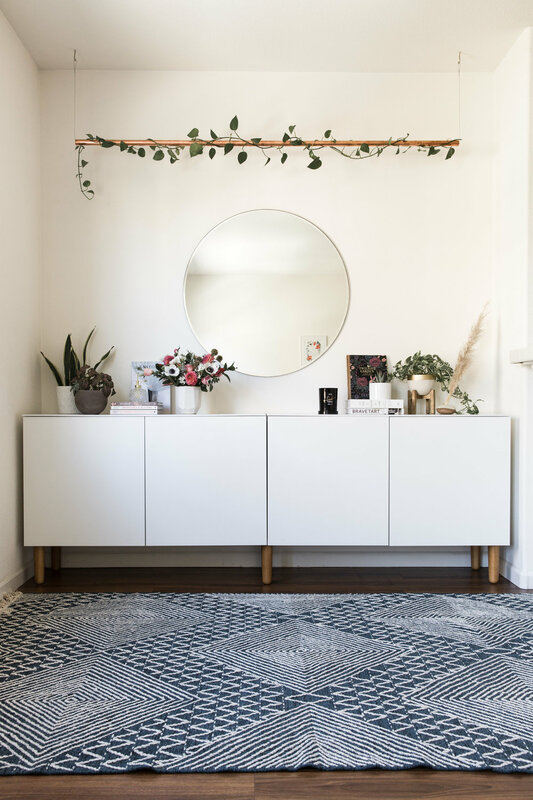 We added a large frameless round mirror from West Elm (discontinued) to give the illusion of a larger and more open space. Then we hung a DIY copper pipe from the ceiling to fill the gap between the mirror and the ceiling and provide an easily modifiable base for Wury to install different types of greenery and florals (her specialty!). In this styled image, Wury simply cut ivy from her own overgrown plant and wrapped them around the copper pipe for a simple, organic look. The countertops were styled with her personal collection of floral books and cookbooks, planters, and of course a beautiful floral arrangement made by Wury herself. And in case anyone doesn’t believe that there are actually toys in there, here are some pictures to prove it! 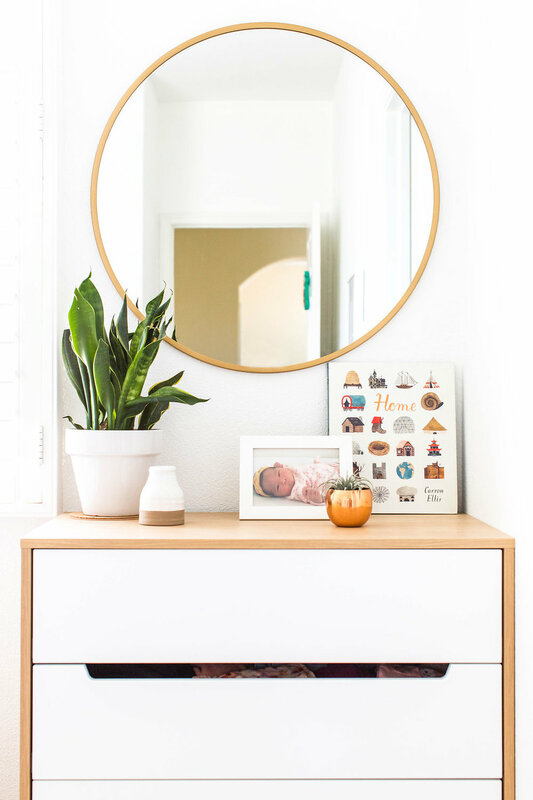 I get so many questions from fellow moms of little children on how to maintain a well-styled home while raising little ones, and I’m a firm believer that you do not have to “give up” having a beautiful and organized home just because you have young children. There are so many creative ways to hide and organize toys, and this is just one example!